A solar-powered dive watch offers convenience and peace of mind over mechanical and battery-powered dive watches. Unlike a mechanical watch, a solar-charged watch will still run for many months if not worn at all. Unlike a battery-powered watch, a solar watch does not need costly and time-consuming maintenance every few years. Solar-powered watches use solar cell panels in the watch display to convert light into energy. 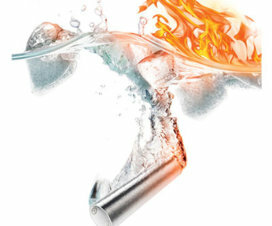 This energy is then stored in a rechargeable battery or capacitor to power the watch. 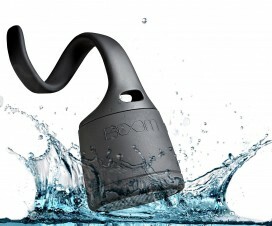 Solar-powered watches can be charged from any kind of light source, from indoor fluorescent lighting to the sun. 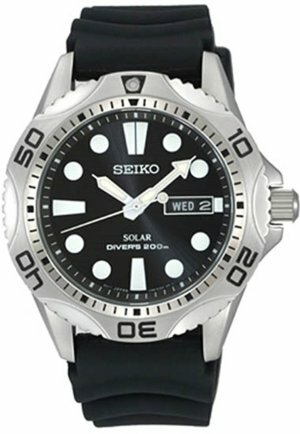 Despite the large number of solar watches on the market, there are only a few solar-powered dive watches. True diving watches should be compliant with the ISO 6425 standard and are suitable for scuba diving. In order to qualify as one of the best solar-powered dive watches, all watches on this list must have an ISO-compliant water-resistance rating of 200-meters (or 20ATM). The ISO-certification is commonly indicated on the watch face with a “Diver’s” label before the water-resistance rating (e.g. “Diver’s 200m”). The 43.5mm-wide Seiko Prospex SNE441 has a classic diving design with a silicone band, one-way rotating bezel, screw-down crown and case back, date display, and LumiBrite glowing hands and markers. This solar diver can go 10 months on its power reserve after a full charge. 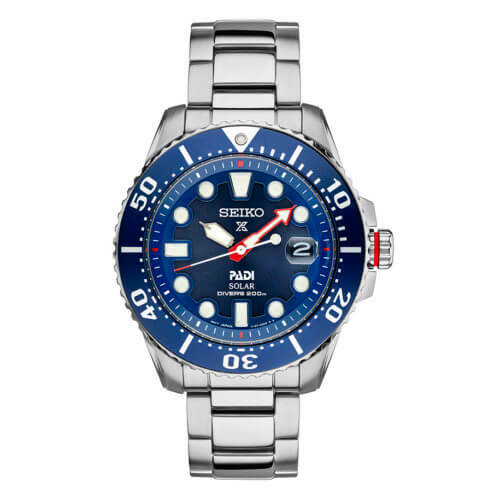 The Seiko Prospex SNE435 has the same case and specs as the SNE441, but with a blue design and a stainless steel band. This watch is a special edition made in partnership with PADI (Professional Association of Diving Instructors) and has a PADI logo on the face. 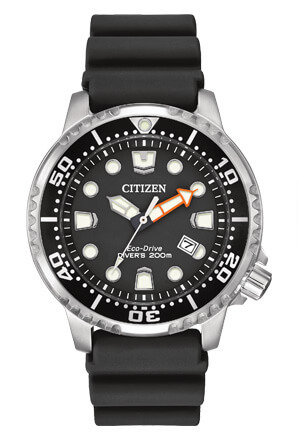 The Citizen Promaster Diver BN0150-28E also has a classic dive watch design and uses Eco-Drive solar technology. Eco-Drive watches are known for using a capacitor rather than a rechargeable battery and Citizen says it “never needs a battery.” This 42mm-wide dive watch has a one-way rotating bezel, polyurethane strap, and a mineral crystal with anti-reflective coating. 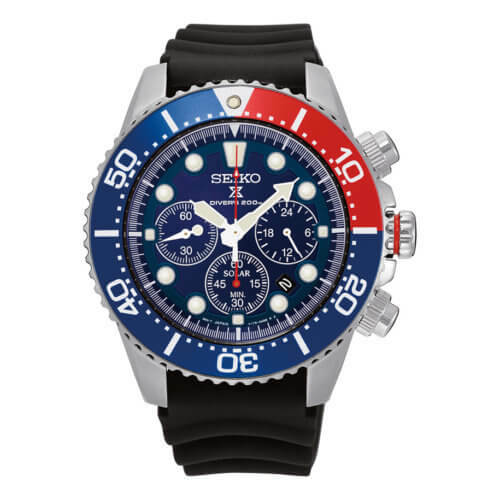 The Seiko Prospex SSC031 is a solar chronograph diver with three subdials. The chronograph measures up to 60 minutes in 1/5 second increments with a split time function. Another subdial serves as a 24-hour indicator. It also has a date display, one-way rotating bezel, LumiBrite hands and markers, and a polyurethane band. This solar-powered watch can go up to six months on a full charge. 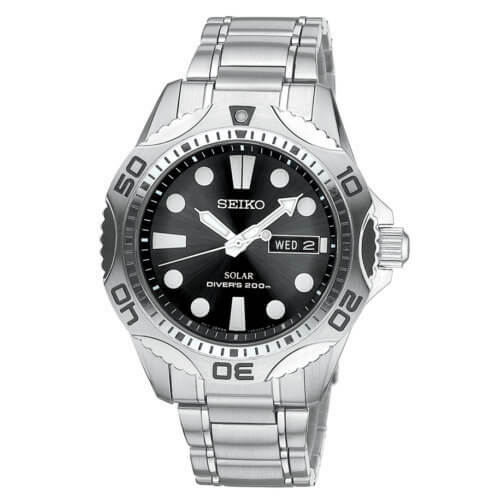 The 42mm-wide Seiko Prospex SNE107 features a more contemporary design for a dive watch but it has the usual features like a one-way rotating bezel, LumiBrite hands and markers, date display (and also day of week). It is similar to the SNE441 and SNE435 with a screw-down case back and up to 10 months of power on a full charge. 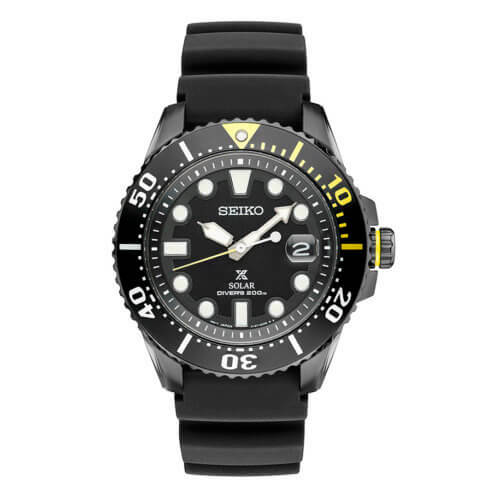 The Seiko Prospex SNE107P2 is a more casual and affordable version of the SNE107 featuring a black urethane band. The Casio G-Shock Frogman GWF-D1000B-1 is the latest generation of G-Shock’s flagship diving watch. 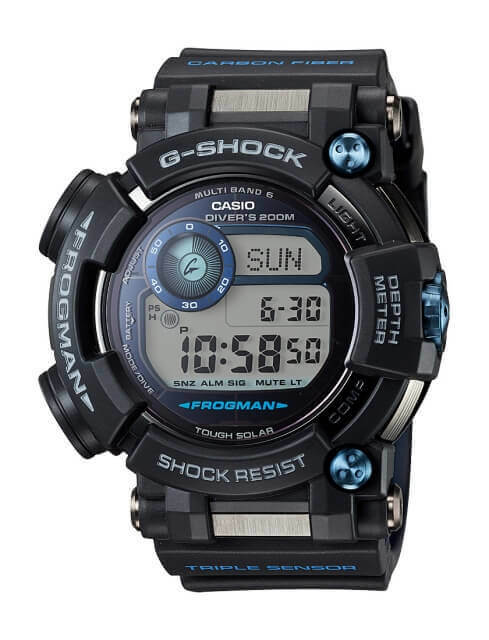 The Frogman is the top all-digital G-Shock and combines Casio’s Tough Solar technology with G-Shock’s legendary toughness. It is the only G-Shock series with ISO-compliant water-resistance and one of the only G-Shock models with a stainless steel inner case housing the module. New features in the GWF-D1000B-1 include a water depth meter, compass, and thermometer, all of which work underwater and can be used with the time stamp memory function. 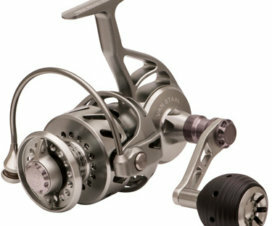 Other high-end features that are new to this generation include a sapphire crystal and a carbon fiber insert band. 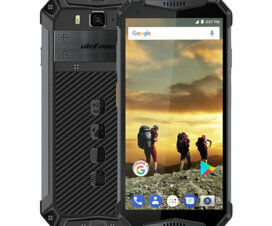 The Frogman also has tide and moon age data and the Multi-Band 6 feature, which will adjust the time automatically through the reception of radio waves. The 53.3mm-wide GWF-D1000B-1 is a large watch and is designed to be worn over wetsuits. 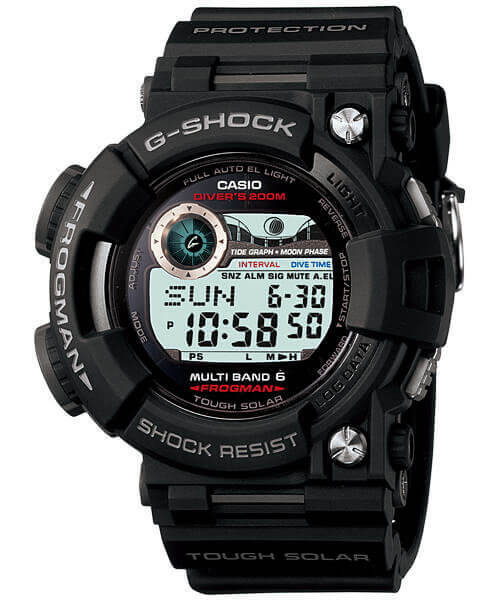 Though now overshadowed by the GWF-D1000, the previous generation G-Shock Frogman GWF-1000 is no slouch and is still a current model being produced in Japan. The ISO-compliant GWF-1000 was actually submersed to 1000 meters in a real world test and it survived with no damage. The 52.8mm-wide GWF-1000 doesn’t have the environmental sensors of the GWF-D1000, but it does have a tide and moon graph, a dive time and surface interval measurement function, and Multi-Band 6 timekeeping. They looks good but I prefer automatic watch. because it doesn’t required battery nor solar. True, but an automatic watch will stop running after a few days if you’re not wearing it. Yeah, that is the consequence of automatic watch if did not wear for a few days.